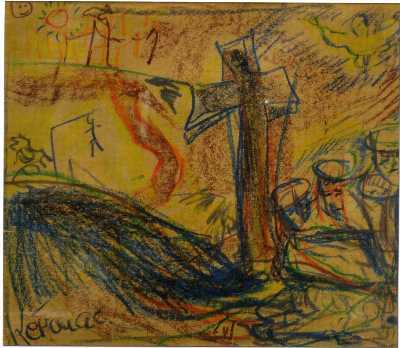 An original, untitled drawing of Jesus' crucifixion executed in colored crayons by Beat novelist Jack Kerouac recently came to market, went on the road and onto a collector's wall, lickety-split, for $7,500. The scene depicts the shadow of Christ on the cross with three figures in the foreground attending to his body as an angel descends from heaven. In the background, a man, presumably, Judas, hangs from a gallows as the sun shines over distant hills. Kerouac boldly signed his name in the lower left corner. Kerouac made the drawing for a favorite niece, using her crayons and sketch paper. Catholicism, which played such a strong, if subtly understated and misunderstood role in his novels and cosmology, is overt here. 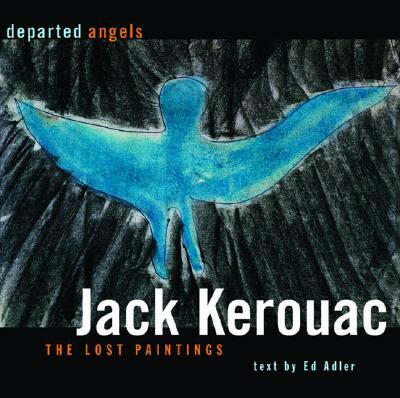 Though a spontaneous work, this untitled painting is a rich, fully realized piece on a par with some of Kerouac's best art as found in his Departed Angels: The Lost Paintings (2004). The appearance of this painting for public sale was something of an event: Kerouac's visual art is held mostly by institutions and examples are exceedingly scarce in the marketplace. Image courtesy of Royal Books, with our thanks.